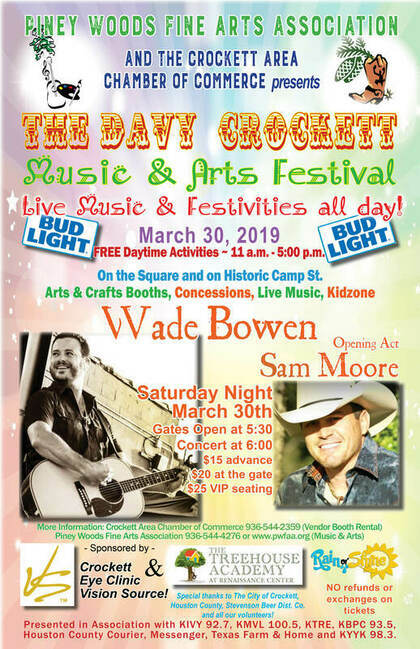 CROCKETT – It’s that time of the year again as winter turns into spring and the Piney Woods Fine Arts Association (PWFAA) shakes off the chill to host the Fifth Annual Davy Crockett Music and Arts Festival. Formerly known as the Piney Woods Music and Arts Festival, the event is set to kick-off this Saturday, March 30 in an expanded format. The last four years have seen the festivities confined to Camp Street but this year’s soiree will encompass Camp Street, the downtown square and West Goliad Avenue between the two. According to information received from the PWFAA this year’s festival will be a collaboration with the Crockett Area Chamber of Commerce. “On historic Camp Street, beginning at 11 am, there will be live music, beer garden, crawfish and concessions, Kidzone and two performances by Laughter League inside Camp Street Café,” a media release from PWFAA stated. “The Kidzone is great fun for children. Your children will have a blast spending time in the bouncy house, creating arts and crafts projects and enjoying the Slappy and Monday show inside of Camp Street Café with shows at 1 pm and 3 pm. The Treehouse Academy Learning Daycare Center sponsors the Kidzone,” the media release stated. Food booths, along with arts and crafts vendors will be on the square while classic cars and motorcycles will be on display along West Goliad. Throughout the day, festival goers will be entertained by live music from a variety of great bands. Among those scheduled to play are: Cristina Amaro with a tribute to Selena; the Brown Sugar Band playing that Motown sound; The Briars, who are billed as “southern folkadelic blues rock”; and Wishbone Haze playing classic rock. In addition to the free daytime activities, there will be a ticketed concert Saturday night with Sam Moore opening followed by Wade Bowen. The concert event is sponsored by Crockett Eye Clinic, Dr. John McCall. Gates open on Saturday, March 30 at 5:30 pm and the concert starts at 6 pm. Tickets are $15 Advance General Admission and $20 General Admission at the gate. Tickets are available now online at www.pwfaa.org or by calling the PWFAA office at (936) 544-4276. Outside food and drink is prohibited. The Davy Crockett Music and Arts Festival is presented in association with KIVY 92.7, KMVL 100.5, KTRE, KBPC 93.5, Houston County Courier, The Messenger, Texas Farm and Home Magazine and KYYK 98.3. Special thanks are extended to: the City of Crockett; Houston County, the Crockett Area Chamber of Commerce and Stevenson Beer Dist. Co.